Rather jejune and often confused narrative sources, frequently authored by militarily ignorant clerics, were and continue to be easily accessible in poor editions and even poorer translations to modern writers for the study of medieval battles. To use these texts properly, however, requires an in-depth understanding of medieval historiography. Unfortunately, the “evidence” provided by these sources, most often used without proper critical assessment, traditionally is combined with romantic notions of chivalry and individualism purveyed by epic fantasies such as the Song of Roland to convince military historians that medieval warfare, i.e., the medieval battle, was as “irrational” as the sources from which the information, itself, was obtained. The research strategies pursued by those who wrote the most influential studies of medieval military history ostensibly ignored the documentary material which provided substantial data on such “unmedieval” subjects as logistics, the costs of castle building, and the engineering of siege machines. (9) Indeed, for those military historians who wrote about the Middle Ages, the focus on battles not only led to a grossly misleading depiction of medieval warfare, but by failing to place the focus where it rightly belongs, i.e., on siege warfare, they did a substantial disservice to our understanding of a millennium of European history. The ostensible reason for the reconnaissance being undertaken here is the appearance in 1992 of Jim Bradbury’s pathbreaking volume, The Medieval Siege. (13) Bradbury, now retired from the University of London, is well known to specialists in medieval military history for his very useful study, The Medieval Archer,(14) as well as for numerous articles dealing largely with eleventh-and twelfth-century Anglo-Norman and Angevin history. In The Medieval Siege, Bradbury very effectively sustains two major theses of exceptional importance through a millennium of history with a fundamental focus on the activities of western Europeans. Bradbury begins with the observation that “there was a direct continuity throughout our period” (p. 1) and regards as his “most notable conclusion” the finding of “how similar are the methods and conventions [of siege warfare] applied at the start, and still at the end” (p. 333). This argument for continuity fundamentally is sound, and Bradbury demonstrates his thesis with many hundreds of examples drawn from more than a thousand years of medieval history, broadly defined. The bibliography of sources, as contrasted to modern scholarship, exceeds two hundred entries and, so far as I have been able to ascertain, these works are cited in the numerous footnotes. In short, though The Medieval Siege is well illustrated and has a chatty style, it is a work that must be taken very seriously. A second edition should look to better proofreading. Bradbury’s argument for continuity is developed by identifying the basic characteristics of siege tactics. He calls attention to a series of steps taken by the offensive force beginning with a call for the surrender of the fortifications to be attacked and followed by the preparation of a blockade. Following the implementation of the blockade, efforts were made to employ one or more of the six S’s upon which siege warfare rested: suborning or subverting key defenders, scaring the garrisons with “propaganda,” sapping the walls, starving the population, storming the defenses, and “shelling” the besieged. The defenders also had their tactics. These included stripping the countryside to deprive the besiegers of the opportunity to forage, sallying forth in sorties to attack enemy positions and assets, sapping the attackers’ mines and machines, suborning and subverting elements of the besieging forces, and “shelling” enemy positions. The number of S’s employed and the order in which they were employed both by the attackers and the defenders would appear to have depended upon the particular circumstances intrinsic to each situation. Bradbury makes no argument to suggest that in any period during the Middle Ages one pattern of S’s prevailed over any other or that any one commander during the course of his career developed a preference for one pattern over another. Bradbury’s second major thesis, though pressed less strongly than the argument for continuity, has the potential to be far more revolutionary. By affirming the well-recognized fact that siege warfare dominated medieval warfare, Bradbury demonstrates from the massive body of evidence that he presents, the comparatively dependent and, indeed, the rather minor position played by mounted combat in the investment of fortifications. One may ask rhetorically in support of Bradbury’s position for the list of cities or even of small rural fortifications made of earth and wood which were taken by a cavalry charge. There was no place for the warhorse in the sapper’s mine, the artilleryman’s battery, or the crossbowman’s belfrey. Men fighting on foot, regardless of their social status, were required for the operation of battering rams and the climbing of scaling ladders. Indeed, one may even wonder if the commanders of armies carrying out sieges were accustomed to bring large numbers of very expensive and highly trained but very fragile warhorses with them. These had to be watered, fed, and guarded while waiting for the unlikely chance that they might be used. (19) The heavily armored knight on horseback, so often erroneously highlighted in textbooks as the medieval “tank,” had at best a minor role to play in siege warfare. The mystique of battle haunts the field of military history and the modern doctrine rather weaselily put by Oman–“the combatant who renounces all attempts to take the offensive must almost inevitably fail in the long-run”–requires that an examination of the strategic aspect of siege warfare be developed. (20) Although Bradbury does not deal with strategy in a systematic manner (see below) he does make clear regarding the Hundred Years’ War that “sieges played a greater role than battles in the whole war, apart from occurring in vastly greater numbers” (p. 156). The battles of Crecy, Poitiers, and Agincourt, which highlight most chapters on medieval military history, were of no consequence to France’s ultimate victory in the Hundred Years’ War. (21) Such generalizations can be sustained for almost any medieval war. Despite the exceptional importance of Bradbury’s major theses, which should force a complete revision of general views regarding medieval military history, there is much about which specialists may complain. For example, Bradbury creates very serious problems through his attempt to periodize medieval siege warfare on the basis of largely implied criteria which are not central to the topic. The problem is irremediably exacerbated by the coverage of the first five centuries (450-950) of the medieval millennium in less than fifty pages while the second five hundred years gets 400 percent more attention. The history of medieval siege warfare surely must begin with the recognition that continuity from late antiquity to the early Middle Ages rested upon the “the enduringdominance of imperial military topography and the unchallenged superiority of ancient military science.”(22) While these points are apprehended by Bradbury, they are not satisfactorily pursued. Military topography includes not only the great walled cities (urbes) built during the fourth century, of which, for example, there were almost one hundred in Gaul alone, but also numerous castra, castella, and even less elaborate fortifications along with a magisterial road system, which was not surpassed in Western Europe until well into the eighteenth century and in some places even later, innumerable stone bridges, and an exceptionally elaborate network of ports. Siege warfare in Europe focussed upon these fortified cities and lesser fortified population centers. These were linked by the Roman transportation system which made possible a very high level of logistic sophistication. Indeed, even in the early Middle Ages the importance of logistics was so thoroughly recognized by military decision makers that Charlemagne devoted considerable human and material resources to building a Rhine-Danube canal which was intended to connect the North Sea to the Black Sea. (23) The proper focus of medieval siege warfare and indeed of medieval warfare in general is the manner in which medieval polities developed their grand strategy or military policy in order to preserve, improve, and often expand these fortifications of Roman and even earlier origin in response to the threats posed by their adversaries. The major wars of the period 950-1200, which Bradbury sees largely in terms of castle warfare, were, in fact, focussed upon the old Roman cities and lesser fortifications of imperial origin. Although, for example, Bradbury gives a great deal of attention to Geoffrey Plantagenet’s siege of Montreuil Bellay ca. 1150, the series of campaigns by which this Angevin count conquered Normandy and took the title of duke ultimately rested upon his capture of the great Roman cities of Caen and Rouen. (27) Fractious magnates might well usurp control over one or another relatively minor fortification or build an “illegal” stronghold, but the great military operations of this period depended upon taking control of the old Roman cities and lesser fortified population centers. Bradbury’s own account of Frederick Barbarossa’s campaigns in Italy makes this point abundantly clear. Indeed, to highlight “castle warfare” for the millennium of medieval history is tantamount to devoting separate chapters to the Flying Tigers, Tito’s partisans, Skorzeny’s raid, Japanese operations off the North American mainland, and the V-2 in a single-volume history of World War II. One chapter of The Medieval Siege which does, however, deserve special attention is “The Early Crusades, 1050-1200,” although Bradbury’s account now has been overshadowed by R. Rogers’s Latin Siege Warfare in the Twelfth Century, which deals ostensibly with the entire Mediterranean basin from a Western perspective. (28) Indeed, Rogers’s study provides a basic treatment for this period of siege operations not only with respect to the Crusades but also to operations in southern Italy and Sicily, Lombardy, and the Iberian Reconquest. He devotes special attention, as well, to the seaborne siege warfare carried out by the Italian maritime states (the two-year siege of Acre is the focus of this chapter), and provides an especially useful account of the highly controversial historiography concerning medieval artillery. Rogers’s efforts to identify crucial differences in the patterns of siege warfare as practiced in various parts of the Mediterranean basin during the twelfth century are less successful. Thus, for example, arguments that Roger II preferred close blockade, while various Crusade leaders preferred massive assaults based upon siege towers, or that some commanders preferred to use artillery to destroy enemy defensive positions while others used such weapons essentially for anti-personnel purposes, are based upon too few examples and an insufficient appreciation of both enemy strategy and specific topographical problems. With regard to strategy and topography, it must be mentioned that neither Bradbury nor Rogers provide a sufficient number of maps and the ones they do provide are not of high quality. Indeed, Rogers has but three, i.e., diagrams of the sieges of Antioch, Lisbon, and Acre. These not only lack topographical indications but also a scale. Despite these criticisms, it is to be made clear that Nicolle has produced a monumental work which not only includes the very valuable drawings and commentaries discussed above, but also an exceptionally important dictionary of technical terms in thirty-three languages or historical dialects(35) and fifty-four pages of bibliography, including unpublished and published primary sources and unpublished and published scholarly works. The bibliography, of course, makes no pretense of being exhaustive, and specialists will undoubtedly find favorite works which have been omitted. It remains to be seen whether military historians will be effective in the exploitation of Nicolle’s “encyclopaedia” for the history of medieval warfare and of siege warfare in particular. Although Nicolle is not given to broad generalizations, he does observe that “plate armor and its associated technology had, of course, never really dropped out of use where the manufacture of helmets was concerned,” and he contends that “plate body-armour during the late Roman and Early Medieval periods” never really disappeared (1:x). Thus Nicolle, like Bradbury and Rogers, makes a major contribution to our understanding of the military during the Middle Ages by emphasizing continuity with the later Roman empire. In addition, by demonstrating in account after account of sieges that the charge of heavy cavalry, the putative forte of the “feudal knight,” was of no significance in the vast majority of major medieval military operations, Bradbury and Rogers have forced a major reconsideration of the state of the question. Although most of the battles in the field during most of the Middle Ages may perhaps not have engaged as many troops as the 80,000 who fought at Catalaunian Plains in 451 or the 35,000-man armies which Charlemagne put into the field for the Avar campaigns,(40) large numbers rather than small numbers characterize medieval siege warfare. For example, the forces of the first Crusade, very conservatively estimated at 35,000, required Byzantine support to take the town of Nicea in 1097. 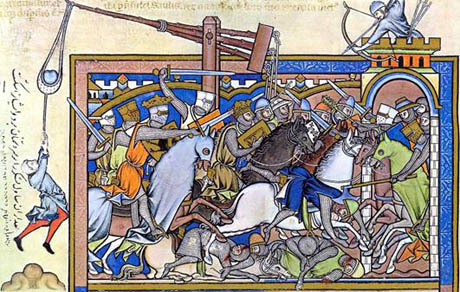 The dominance of siege warfare highlights the vital importance of strenuous training and high levels of unit cohesion throughout the Middle Ages. (41) A crew of fiftysappers digging a mine only a hundred meters in length at a depth of ten meters beneath the walls of a city surely required levels of expertise, training, and cohesion which rival those of submariners who might some day come under depth charge attack by an enemy destroyer. The combat team operating a battering ram under enemy fire or a catapult crew keeping their weapon in operation day and night certainly had to have obtained training and unit cohesion not inferior to that of modern tank or mortar crews. (42) Even the dozen men who were assigned to carry each fifteen-meter-long scaling ladder across a hundred-meter killing ground, place and secure it against the wall, and then climb it in a prescribed order while under withering enemy fire required far more than “dumb” courage. The reconnaissance of siege warfare in the Middle Ages undertaken here in response to the stimulating works of Bradbury and Rogers makes clear that an entirely new state of the question must be formulated regarding the military in medieval Europe. Knights, heavy cavalry, isolated motte and bailey towers dominating a lawless countryside, small numbers of effectives, as well as a serious lack of training, discipline, and unit cohesion must be swept away as the dominant themes. Continuity from the later Roman empire through the Middle Ages is the proper focus. The medieval world was dominated by imperial military topography, antique military science, and the militarization of the vast majority of the able-bodied male population. 1. Hans Delbruck, Geschichte der Kriegskunst im Rahmen der politischen Geschichte, 2d ed. (Berlin, 1923), vols. 2 and 3 For the convenience of the reader, I have cited the English translations, History of the Art of War: Within the Framework of Political History, vol. 2, The Germans, and vol. 3, The Middle Ages, trans. Walter J. Renfroe (Westport, Conn., 1980, 1982). See 3:324 for the quotations. Delbruck’s work on medieval military history, magisterial when published, should now be given an honorable burial. It is of no value for the medieval period and often is seriously misleading. These volumes do, however, have considerable value for the history of ideas and the history of historical writing. In this context, particular mention should be made of the fine English translations by Dr. Everett L. Wheeler of the Latin and Greek quotations scattered throughout the English translations of Delbruck’s volumes. 2. History of the Art of War in the Middle Ages, 2 vols. (2d ed. 1924; reprint, New York, 1964), 2:52-54. Interestingly, Oman followed Kohler (see below note 5) with regard to siege technology. 3. H. Guerlac, “The Impact of Science on War,” in E. M. Earle et al., eds., The Makers of Modern Strategy: Military Thought from Machiavelli to Hitler (Princeton, 1943), 522. This observation is quoted (apparently from a different edition) by Christopher Duffy, Siege Warfare: The Fortress in the Early Modern World, 1494-1660 (London, 1979), xi, who expresses ostensible agreement with Guerlac. 4. 2 vols. (Paris), 1:17. 5. La Guerre au moyen age (Paris, 1980) and translated by Michael Jones as War in the Middle Ages (Oxford, 1984); see 101 and 219 for the quotations. Pp. 102-6, 116, 193-207, 211-12, 240-41, 247-48, 283, focus the discussion on siege weapons. Not all writers on the military history of the Middle Ages have ignored siege warfare. The most important and also the most controversial work is that of G. Kohler, Die Entwickelung des Kriegswesens und der Kriegfuhrung in der Ritterzeit von Mitte des 11 Jahrhunderts bis zu den Hussitenkriegen, 3 vols. (Breslau, 1886-90). Kohler’s work, however, was so thoroughly savaged by contemporary reviewers that it has had very little positive influence. Indeed, much effort has been expended to use Kohler’s work to demonstrate what should not be done. See the general discussion by R. C. Smail, Crusading Warfare, 1097-1193 (Cambridge, 1956), 4-7; and the more specific critique with a good survey of the literature by R. Rogers, Latin Siege Warfare in the Twelfth Century (Oxford, 1992), 254-73. 7. Smail, crusading Warfare, 15, cites the example of Oman to good effect. 8. One of the four basic characteristics of the so-called “military revolution” whose contours have dominated early modern military history since the late 1950s (Michael Roberts, The Military Revolution 1560-1660 [Belfast, 1956] and reprinted in Michael Roberts, Essays in Swedish History [Minneapolis, 1967], 195-225) putatively took shape between ca. 1560-1660 and concerns the loss of ascendancy on the battlefield of the heavy cavalry. Dennis E. Showalter, “Caste, Skill, and Training: The Evolution of Cohesion in European Armies from the Middle Ages to the Sixteenth Century,” Journal of Military History 57 (1993): 407-30, also sees the heavy cavalry as dominating the medieval battlefield. The myth of heavy cavalry dominating the medieval battlefield is severely harried in Bernard S. Bachrach, “The Middle Ages,” in Geoffrey Parker, ed., The Cambridge Illustrated Military History (Cambridge, forthcoming), ch. 4. Put simply, no one type of fighting man dominated the battlefields of Europe for a hundred years much less r a thousand years during the Middle Ages. 9. Lot, as contrasted to Delbruck and Oman, was trained as a medievalist but was not a specialist in military history. However, it was not until. F. Verbruggen, a military officer who was trained at Ghent as a medievalist by F. L. Ganshof, published his magisterial De Krijgskunst in West-Europa in de Middeleeuwen (Brussels, 1954), that a giant step forward was taken toward a proper understanding of medieval combat as conducted on the battlefield. Unfortunately, Verbruggen did not address his substantial talents and training to siege warfare and concentrated on battles in the field. The English translation of Verbruggen’s work as The Art of War in Western Europe during the Middle Ages, from the eighth Century to 1340, trans. Sumner Willard and S. C. M. Southern (Amsterdam-New York, 1977), makes this study easily accessible and is cited in the present paper for the convenience of the reader. For research purposes, however, the original is required because the author’s valuable notes were omitted from the translation. The translation, however, adds atreatment of the eighth century whereas the original began in the ninth century. Verbruggen, 1-22, and esp. 1-6. Also see Bernard S. Bachrach, “Logistics in Pre-Crusade Europe,” in John A. Lynn, ed., Feeding Mars: Logistics in Western Warfare from the Middle Ages to the Present (Boulder, 1993), 57-78. 10. See, for example, the traditional views of Robert J. Bartlett, “Technique militaire et pouvoir politique, 900-1300,” Annales ESC, September-October 1986, 1135-59; R. H. C. Davis, The Medieval Warhorse (London, 1989), esp. 11, and the review of Davis by Bernard S. Bachrach in International History Review 13 (1991): 347-48. Showalter, “Caste, Skill, and Training,” 407-30, keeps the model but properly nuances the quality of military behavior consistent with the researches of Verbruggen. 11. The observation by Joachim Bumke, Studien zum Ritterbegriff im 12. und 13 Jahrhundert, 2d ed. (Heidelberg, 1976), 147-48, that “the chivalric knight of courtly literature…is an educational ideal…and a phenomenon of intellectual rather than of social history” is particularly apt. I cite here the translation by Stephen Jaeger, The Origins of Courtliness–Civilizing Trends and the Formation of Courtly Ideals: 939-1210 (Philadelphia, 1985), 208-9. Note that neither Bumke’s nor Jaeger’s work demonstrates an understanding of medieval military history. Indeed, both scholars indulge the sterotypes under attack here. 12. For a new model, see Bachrach, “The Middle Ages,” forthcoming. For example, the point needs to be made for emphasis that the armies of the later Roman empire, i.e., the two centuries following the reforms of Diocletian, were not very like those of the later Republic and early Empire. 15. See, for example, Contamine, War in the Middle Ages: “Ignorant of proper discipline, easily discouraged, the Barbarians used very rudimentary tactics” (p. 11) and they had “an almost non-existent logistic” (p. 12). 16. For various details of Merobaudes’ life and career, see Ferdinand Lot, “Un diplome de Clovis confirmatif d’une donation de patrice romain,” Revue belge de philologie et d’histoire 17 (1938): 906-11; Karl. F. Stroheker, “Spanische Senataoren der spatromischen und westgotischen Zeit,” Madrider Mitteilungen 4 (1963), followed by Friedrich Prinz, Fruhes Monachtum im Frankenreich: Kultur und Gesellschaft in Gallien, den Rheinlanden und Bayern am Beispiel der monastichen Entwicklung (4. bis 8 Jahrhundert) (Munich and Vienna, 1965), 70-71; and Frank M. Clover, Flavius Merobaudes: A Translation and Historical Commentary in Transactions of the American Philosophical Society n.s. 61.1 (Philadelphia, 1971): 7-10. Merobaudes’ good classical education is well documented through the surviving poems and panegyrics which he authored. His military service is highlighted by campaigns in the Alps during the early 430s, in connection with which he was given the rank of comes rei militari or that of dux, as evidenced by his appointment as a count of the Consistory, and appointment in 443 to the rank of magister utriusque militiae which he exercised in Spain as successor to his father-in-law, Austurius. Merobaudes’ honors included the award of the name Flavius for distinguished military service, admission to the Senate of Rome, the title of patricius, and a bronze statue erected in Rome by imperial order. 17. Panegyricus, II, lines 144-45, in F. Volmer, ed., Flavius Merobaudes reliquiae, MGH, Auctores antiquissimi (AA) (Berlin, 1905), 14, 1-20. 18. Panegyricus, II, lines 149-51. 20. The Art of War, 2:52. 21. For a good recent account, see Christopher T. Allmand, The Hundred Years’ War: England and France at War, c. 1300-c. 1450 (Cambridge, 1988). 22. Bachrach, “The Middle Ages,” forthcoming. 23. Bachrach, “Logistics in Pre-Crusade Europe,” 67-68. 24. Bernard S. Bachrach, Fulk Nerra: The Neo-Roman Consul: A Political Biography of the Angevin Count (987-1040) (Berkeley and Los Angeles, 1993). 25. Bernard S. Bachrach and Rutherford Aris, “Military Technology and Garrison Organization: Some Observations on Anglo-Saxon Military Thinking in Light of the Burghal Hidage,” Technology and Culture 31 (1990): 1-17. 26. Bernard S. Bachrach, “The Practical Use of Vegetius’ De Re Militari During the Early Middle Ages,” Historian 47 (1985): 239-55. 27. J. Chartrou, L’Anjou de 1109-1151: Foulque de Jerusalem et Geoffroi Plantagenet (Paris, 1928), remains basic but soon will be replaced with regard to the “Conquest of Normandy” by Rob Helmrichs’s forthcoming doctoral dissertation on Geoffrey Plantagenet (University of California at Santa Barbara). 29. Cf. White, “The Crusades and the Technological Thrust of the West,” in V. J. Parry and M. E. Yapp, eds., War, Technology, and Society in the Middle East (London, 1975). 30. Carroll Gillmor, “The Introduction of the Traction Trebuchet into the West,” Viator 12 (1981): 1-8. 31. Indeed, this is a difficult area of research and can easily turn into a disaster as Lynn White’s notorious stirrup and mounted shock combat thesis dramatically illustrates. On this problem, see Bernard S. Bachrach, “Animals and Warfare in Early Medieval Europe,” Settimane di Studio del Centro Italiano di Studi sull’alto Medioevo 31 (Spoleto, 1985): 1, 707-64; and Bernard S. Bachrach, “Charles Martel, Mounted Shock Combat, the Stirrup and Feudalism,” Studies in Medieval and Renaissance History 7 (1970): 49-75. Both are reprinted in Bernard S. Bachrach, Armies and Politics in the Early Medieval West (London, 1993). See also Kelly DeVries, Medieval Military Technology (Peterborough, Canada, 1992), 95-110, for an independent examination of the state of the question. 32. White Plains, N.Y., 1988, 2 vols. 34. See, for example, the methodological studies by Bernard S. Bachrach, “A Picture of Avar-Frankish Warfare From a Carolingian Psalter of the Early Ninth Century in Light of the Strategicon,” Archivum Eurasiae Medii Aevi 4 (1984): 5-27 (reprinted in Bachrach, Armies and Politics in the Early Medieval West); and Bernard S. Bachrach, “Some Observations on the Bayeux Tapestry,” Cithara 27 (1987): 5-28. 35. There surely will be controversy concerning both the methods by which this dictionary was compiled and the values given to various terms. This type of technical argument, however, is well beyond the scope of this paper. 37. For the early period, see Bernard S. Bachrach, “Grand Strategy in the Germanic Kingdoms: Recruitment of the Rank and File,” in Michel Kazanski, ed., L’Armee romaine et les barbares du IIIe au VII siecle, 40 (Paris, 1993), 1-9. 38. For the later period, see Contamine, War in the Middle Ages, 84, 117, 155. 39. Bachrach and Aris, “The Burghal Hidage,” 1-17. 40. Bernard S. Bachrach, “Some Observations on the Armies at Cataluanian Fields: An Essay in Military Demography,” forthcoming in the Festschrift celebrating the sixtieth birthday of Herwig Wolfram. 41. Cf. Showalter, “Caste, Skill, and Training,” 407-30, who prefers an evolutionary model. This entry was posted in Articles and tagged arms&armour, Battle, battles, Siege Engines, Siege Warfare, sieges, Technology. Bookmark the permalink.